The Northern Lights, wild reindeer, snowmobiling, magical fjords, -25°C and the Northern Lights for a second time were the stand out things to do in Tromso. This place is a winter wonderland mixed with an adventurer’s dream, with plenty to do and see even in the insane cold and limited daylight. Here’s my ultimate Tromso guide, complete with our Tromso itinerary, accommodation, tours, tips and costs. Enjoy! Norway uses the krone. 10 krone is 88p, $1.70NZD or $1.65AUD at the time of writing (March 2019). Tromso, like the rest of Norway, is not cheap. If you’re on a tight budget then it might not be the place for you, but that’s not to say you can’t do it cheaply. If you’re happy to stay at a campground or in a hostel, make your own food and focus on one or two key experiences, then it’s definitely doable. Just don’t expect five-star hotels and three-course meals unless you’re on (at least!) a six-figure salary. You lucky bugger. Tromso’s average temperature in summer is around 12-15°C, and in winter is around -5–7°, but it can be much colder up the cable car mountain and around the fjords. We experienced -15° on our snowmobiling tour, and with windchill it was more like -25°. Ever felt your eyelashes freeze together? It’s not particularly enjoyable. Most people in Tromso speak at least basic English, but it’s always nice to know some local words to show that you’re making an effort. The best time to visit Tromso depends on your plans when you’re there. 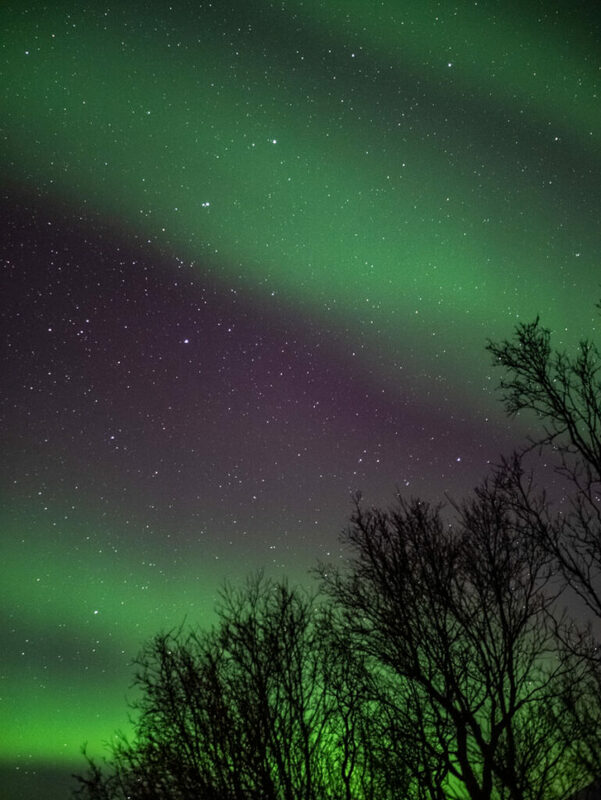 The Northern Lights are visible from September to April, and it’s the Polar Night from mid-November to mid-January. That means the sun doesn’t rise above the horizon (yep, for two months! ), and that gives you way more darkness to try spot the lights. We were there at the end of January and the sun rose around 9.30 and set around 2.30. During winter you can go husky sledding, snowmobiling, skiing, ice fishing and loads more. If you visit Tromso in summer, you’ll be treated to stunning landscapes, magnificent hikes, kayaking around the fjords, Arctic beaches, a bustling student town and the Midnight Sun if you’re there from end of May to end of July. We flew from London Gatwick to Tromso with Norwegian direct, which took 3.5 hours each way. Norwegian is the only airline that flies direct, and you’ll probably pay between £120 and £150 return from London, cheaper if you book in advance and don’t fly on weekends. If you’re travelling in the summer then there may not be direct flights available, in which case you’ll need to fly to Oslo and then up to Tromso from there. I’m impatient though so I always pay a bit extra if there’s a direct option available! We landed at 9pm to -10° at the airport and we were wearing very mild London winter clothes (including bare ankles ha), so keep that in mind when you’re packing your hand luggage. 260 NOK from the airport to Tromso Lodge and Camping. Go right when you come out of arrivals and the taxi line is at an exit about 100m down the airport. You can pay by card! Hotels in Tromso are expeeeensive, like over £120 per night for somewhere pretty average, room only. We split our time between two gorgeous (and cheap!) options: Tromso Lodge and Camping for two nights, and an Airbnb in the city for two nights. I would definitely recommend booking somewhere with access to a kitchen because eating out is insanely pricey, so being able to cook some noodles or porridge is a real money-saver. Located across the bridge from the main city centre, Tromso Lodge and Camping is maybe the most photogenic campground on the planet. In winter anyway! They’ve got gorgeous little red cabins, straight out of Wes Anderson movie. We got a traditional cabin which was slightly bigger than the cheaper option, with a full kitchen, lounge, dining area, bathroom and two rooms with two bunk beds each. Note that their opening hours are 7am to 8pm, and if you arrive late (like we did, thanks flight delays) they just put your key in the grey bin by reception door. 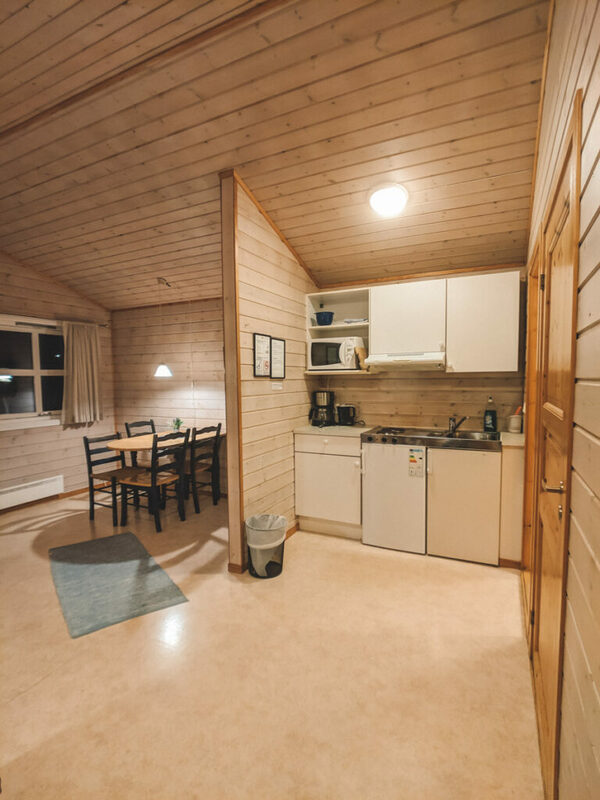 The campground is colder than Tromso city centre as it’s located in a valley under the mountains, but the insulation is perfect so you don’t feel the cold at all. It’s about seven minutes’ walk to the nearest bus stop (straight into the city), 30 minutes’ walk to the cable car and about 45 minutes walk across the bridge to the town centre. After two days in the crazy cute campground, we moved house into a central city Airbnb, just two minutes from the main street in Tromso. The apartment was one bedroom, one bathroom, a full kitchen and spacious lounge. It was definitely one of Tromso’s cheaper options and it set us back about £110 per night including the cleaning fee. It also had a fold out couch so could sleep an extra two people if needed. The location was ideal, the key was in a lockbox right outside and there was loads of space for us to unpack our suitcases into an absolute mess. The insulation wasn’t as good as Tromso Lodge and Camping but the bed linen was super warm (duck down!) and Berit brought us spare blankets when we mentioned that we were a bit cold after a day of snowmobiling in -30°C. Now that’s customer service! Get £25 off your first Airbnb booking when you use this link! Tromso is a small town, and it’s easy to get around by bus or by taxi. There’s no Uber but Tromso Taxi has their own app where you can book and pay for rides. It cost us 260 NOK to get from the airport to our lodge, and then about 160 NOK to get from the lodge to the city when we needed to move our suitcases. The bus is easy too, just download the Troms Mobillett app to pre-purchase tickets (33 NOK per journey), or pay in cash when you jump on (which is slightly more expensive). We loaded 200 NOK at the beginning of the trip and had 68 NOK leftover after taking two trips each, including one out to the airport. You can also buy a 24 hour pass for 100 NOK but I think it’d be unlikely that you’d use the bus enough to make it worth it. Note that the buses don’t go that often, a maximum of four times per hour in peak times, so check the timetable before you plan your transport. In summer I imagine Tromso would be very car-friendly, but I would not recommend hiring a car in winter unless you’re an experienced winter/snow/ice driver. 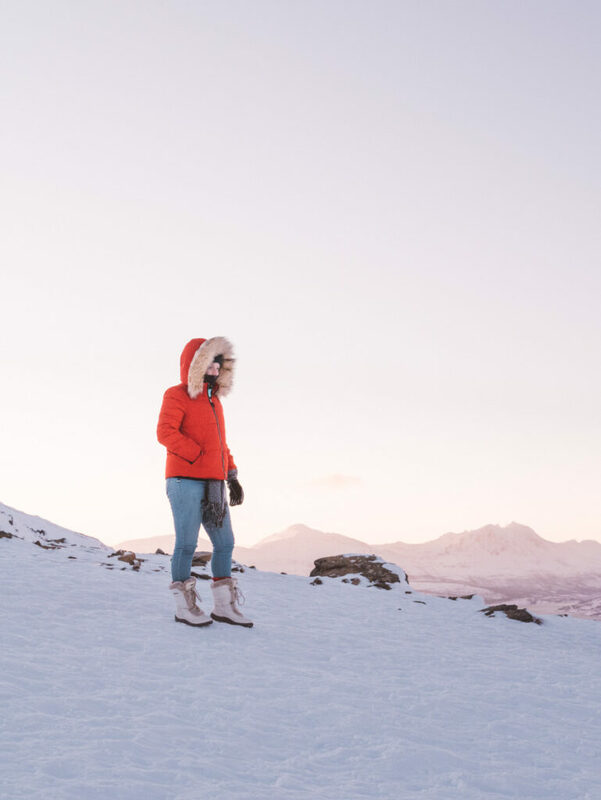 Tromso is a winter wonderland with plenty to do and see if you’re up for an adventure, but you need to get out of the city for the best experiences. In Tromso itself make sure you take a trip up the Fjellheisen cable car, across the bridge from the central city. It costs 210 NOK return per adult, or you can buy one way and walk either up or down (not recommended in winter unless you have appropriate winter hiking gear). The view is truly incredible, especially if you catch it at the perfect light. We were there in only the second week after the polar night so we had about five hours of the most beautiful golden light, with the sun only just rising over the mountains. One thing to note is that the top of the cable car gets freezing, as in the coldest I have ever been. We weren’t particularly prepared for just how cold the wind would be, and that took it from a balmy -10 to probably about -25 with the wind chill factor. On top of this we were being stupid and trying to take photos with no gloves on, and it very quickly went from uncomfortably chilly to ‘is my finger actually going to fall off’. Wear a buff/neckwarmer, gloves, a beanie, warm socks and waterproof shoes. You’re always at the mercy of Mother Nature with this one but it wouldn’t be a trip to Tromso without a lights chase. We did a Northern Lights Minibus Chase with Chasing Lights (it’s all in the name ya know…) two nights in a row and we were treated to the show of a lifetime. That tour is 1800 NOK per person, which includes pick up from the city, comfy transport in a minibus for up to 14 people, free WiFi, tripods, warm outdoor suits and boots, dinner and some snacks, and drop off to your Tromso city hotel afterwards. Oh and all Chasing Lights tours come with incredible tour guides who double as professional photographers (shout out to Bert, Jonas, and Hermann!). 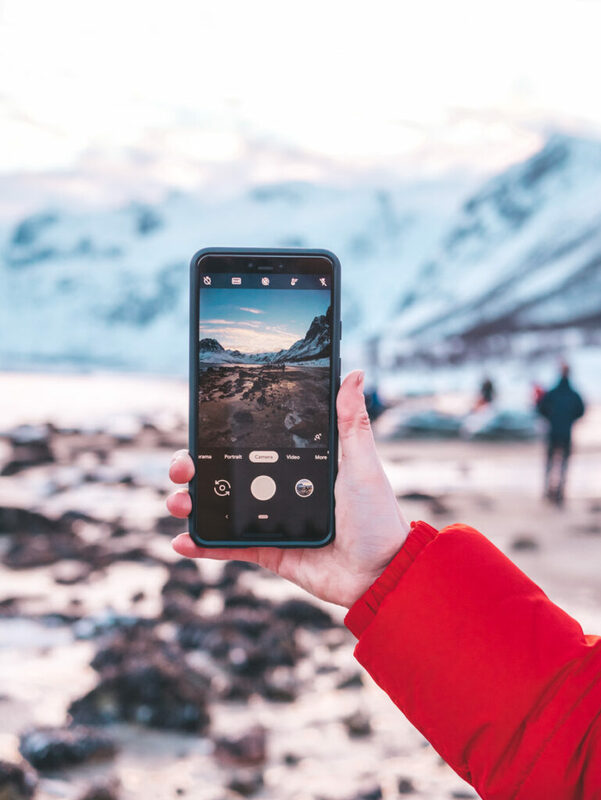 This means you can legitimately soak up the experience without worrying about capturing photos, and you’ll still get amazing shots for the ‘Gram. If you’d like a cheaper option they also offer a big bus chase on a bus with up to 50 passengers. Hands down one of the best things I’ve done in my life, and the greatest way to celebrate my 27th birthday. 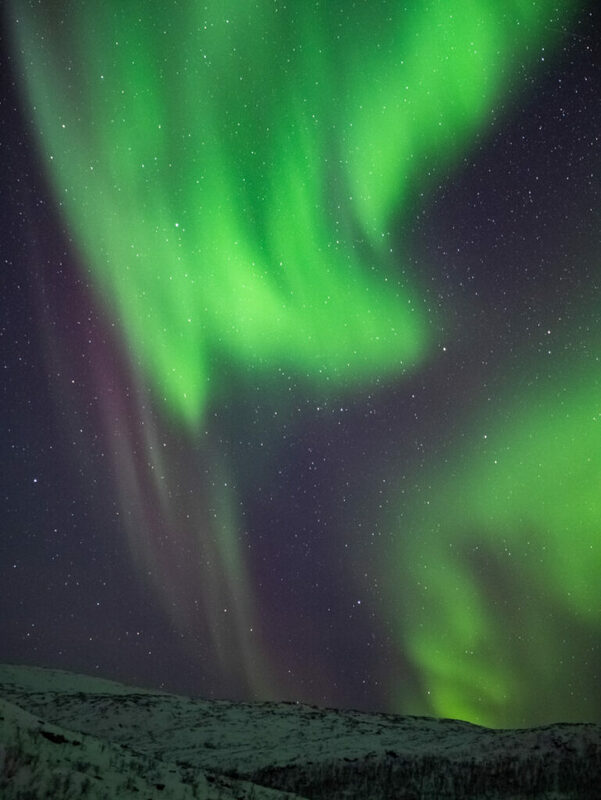 Read more about our Northern Lights experience and see loads of photos here. The area around Tromso is stunning, and we did a fantastic Arctic Fjords road trip with Chasing Lights around the Arctic Fjords for a day. The tour goes from 9am to 3/4pm, and includes a suit and boots if necessary, a light lunch and hot choc, professional photos and transport in a comfy van with WiFi. We drove around mountains, lakes, inlets and beaches, visiting some postcard-perfect viewpoints that are almost completely untouched. We saw reindeer, had a campfire lunch on the beach, ran across a frozen lake and watched the sun set behind towering snow-capped mountains. These are the kinds of places that make you feel a world away from reality, and I LOVE that feeling. I first snowmobiled in Iceland and absolutely fell in love, and my second go in Tromso did not disappoint. 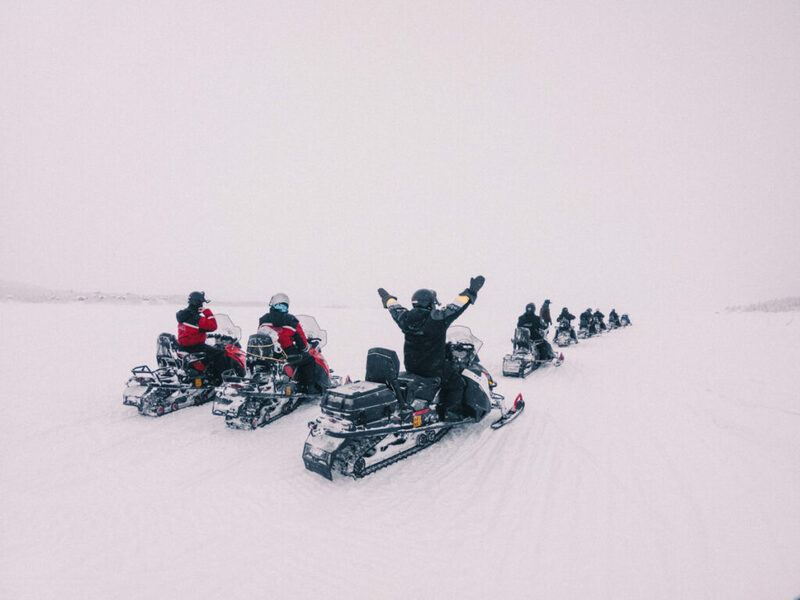 There are a couple of different tour operators who offer snowmobile day trips, but ours was the Snowmobile Adventurewith the legends at Chasing Lights. We departed Tromso early in the morning for a 2.5 hour drive across the border to Finland, where we kicked off our adrenaline rush of the trip. In total we spent about three hours on the snowmobiles all up, stopping to swap drivers, take photos and have a campfire lunch in a traditional Sami hut, as well as visiting the three-country border between Finland, Norway and Sweden. It’s bloody freezing but you’ll get full weather-proof gear, and you’ll forget about the -25° chill when you’re in the middle of a snowy forest with nothing around you except pure white. It’s a winter heaven! It depends on how rich you are! If you aren’t at all (like meee) you’d best stick to food from home, supermarket snacks or maybe the odd cafe visit. I paid 40 NOK for a Vitamin Water from a convenience store, 180 NOK for two local beers, and 119 NOK for a chicken nugget meal at BK (the northernmost BK in the world though so that’s gotta be worth something). Save your money for more important things, like chasing the Northern Lights, and take microwaveable meals and your own snacks. On that note, if you are on a day or evening tour, you’ll probably get a meal (like fish soup or beef stew) and marshmallows to roast over the campfire. If you can afford to pay for meals then I’d recommend Cafe Sann for drinks, Burgr for burgers and Risø for coffee and pastries. I can also recommend the little pancakes and syrup from BK (all day baby!) and the Snickers shake from Mix, a chain convenience store. Probably the greatest £6 I spent in Norway. THERMALS. It gets DAMN cold. Layers are your best friend, ensure that you have plenty of singlets/vests, leggings and warm socks as well as jumpers, proper trousers (not jeans), jackets, boots, beanies, scarves and gloves. We also took hand-warmers which were a lifesaver up the top of the cable car! If you’re on a budget then pack your own food to save money, like microwave noodles, muesli bars, cereal and snacks. I used the WeSwap currency exchange card to get the best exchange rate available (only 1% commission if you exchange seven days before you use it!). Get £10 free with your first load of £50 when you use the promocode ALEXX10. Have you been to Tromso, or is it on your bucket list? Have I missed out anything that you want to know about Tromso? Tell me in the comments below! Thanks to Chasing Lights for hosting us on their epic Tromso tours, and thanks to Tromso Lodge and Camping for offering us media rates to stay with them. As always, all opinions are my own and are based on my personal experience. Please note this blog contains affiliate links that give me a small commission from any purchase, at no extra cost to you. I would never advertise anything I don’t use or believe in, and this commission helps Finding Alexx reach more travellers. Thank you for supporting me!